The Department of Information and Communications Technology (DICT), Department of Interior and Local Government (DILG) and the National ICT Confederation of the Philippines (NICP) officially launched last Friday, July 20, the Digital Cities Philippines Awards for Best Practices in eGovernance at the level of local government units (LGUs). 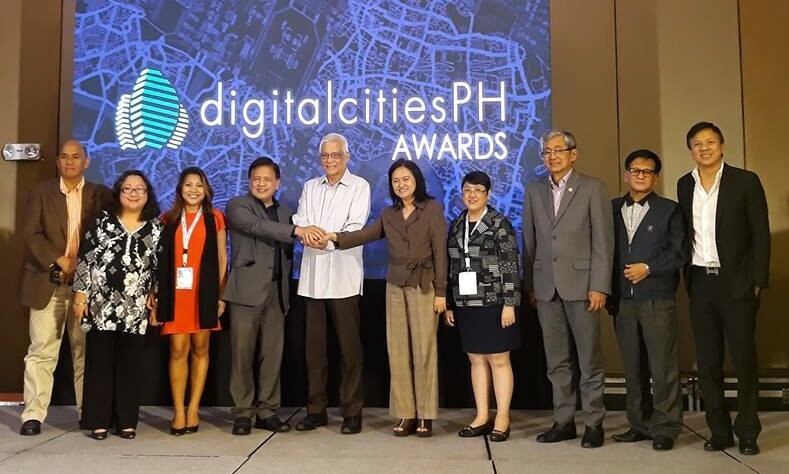 The awards were launched with a ceremonial handshake among DICT Secretary Eliseo Rio, Jr. DILG Bureau of Local Government Development (BLGD) head Anna Liza Bonagua and NICP President Antonio Del Carmen during the Digital Cities PH Summit. NICP Vice President Jocelle Batapa-Sigue in her launching speech said, in 2011, during her presidency in the NICP, they met with DILG Undersecretary Austere Panadero to explore how local ICT champions can collaborate with the DILG to improve ease of doing business in the local government level as one important parameter under the business environment of the ICT industry location scorecard. In 2012, DILG and NICP signed a Memorandum of Agreement to partner for the eGOV awards which will recognize integration of ICT in LGU service delivery. Beginning that year NICP staged the eGOV Awards in partnership with DILG BLGD and all ICT councils under NICP. Since 2012, NICP was able to gather over 200 eGov projects from Luzon, Visayas, and Mindanao. Batapa-Sigue said the awards aim to highlight and encourage the effective and efficient delivery of services and performance of the duties and responsibilities by local government units and to share and replicate innovative practices and commend and collate practices in LGUs in integrating ICT in their processes to serve as an example and benchmarks to other LGUs. It also aims to improve the business development, social services and the ecosystem of the LGUs and motivate the private and business sector to actively participate and invest in the growth of the LGUs and to promote citizen’s responsibility and participation as well as accountability, efficiency, and transparency in governance and encourage innovation. Best In Customer Empowerment (G2C) Award recognizes the measurable effect of an LGU’s outstanding practices using ICT solutions in the education and engagement of the public and in the use of electronic facilities towards providing improved timely and relevant delivery of public services. Best in Business Empowerment (G2B) Award cites the significant effect of an LGU’s laudable practices in integrating ICT solutions and the LGUs responsiveness to the needs of business enterprises, thereby creating business opportunities. Best in Government Inter-operability Empowerment (G2G) Award cites the valuable impact of an LGU’s initiative to connect data and systems with other government offices, both national and local for the convenience of their constituents and to improve its public service delivery. Best in Digital Finance Empowerment (P2G) Award commends the initiative of an LGU to promote e-commerce or electronic payment facilities and systems to ensure effective revenue generation and improving the financial management of the LGU as well as giving convenience to the public. Best in Data-Driven Governance (D2G) Award cites the efforts of local governments in recognizing that good governance through ICT goes hand in hand with the fair and responsible processing and use of data. Best in Systems for Global Competitiveness (G2W) Award cites the efforts of an LGU in developing world-class systems in using ICT that are at par with international or internationally –recognized standards, thus making the LGU globally competitive, recognized, and virtually accessible and interactive. One city, one province and one municipality will be declared as champion per category based on four major criteria, namely Innovative management, Impact, Relevance (25 points) and Replication potential and sustainability. The Philippines will rise as a digital nation with every local government unit doing their share in effectively creating strategies to bring government closer to citizens, systems that will enhance transparency and accountability, platforms that will improve the business environment, attract investors confidence and stakeholders’ participation, and develop sustainable programs to achieve the goals of the communities, Batapa-Sigue said.